Keen observers of the cityscape will notice churches face many of the squares. Christ Church (Episcopal), the Independent Presbyterian Church, First Baptist Church and Trinity Church (United Methodist) are antebellum edifices designed in the style of Neoclassical, which was fashionable until the revivalism of Gothic came to dominant ecclesiastical architecture in the second half of the 19th century. Unfortunately, most of Savannah’s old churches are closed outside of regular services, unless visitors make special arrangements. Surrounding the churches are the grand old homes of varying architectural styles, which blend rather seamlessly. Think Federal, Second Empire and even Richardsonian Romanesque. 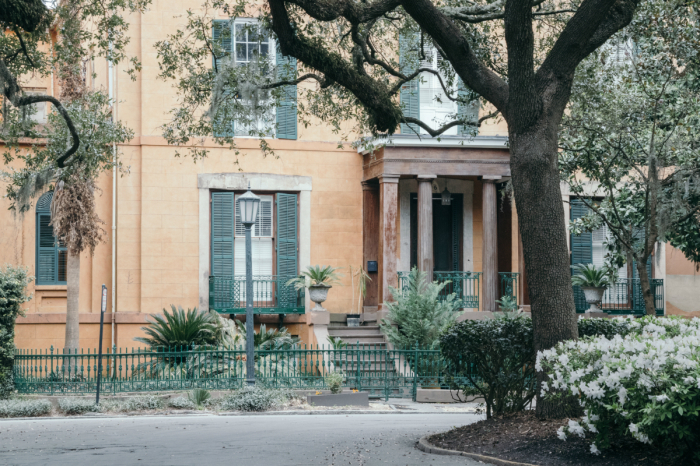 One such mansion, built in 1818 in the very English style of Regency, it today houses the Telfair Academy art museum. On the other end of town below 40-foot bluffs is the Savannah River and the aptly named River Street. Here along the waterfront are old brick warehouses — formerly used to store cotton — that have been converted to restaurants, bars, shops and hotels. This area is particularly nice for an after-dinner stroll along the quay. I stayed at The Alida, a newish boutique hotel in Marriott’s Tribute Portfolio, located by the waterfront. It’s one of several upscale hotels within walking distance of just about everything to see and do in Savannah. Savannah/Hilton Head International Airport is served year-round by several airlines, including American, Delta, JetBlue and United. There is no need for a rental car as Uber or taxis are plentiful.